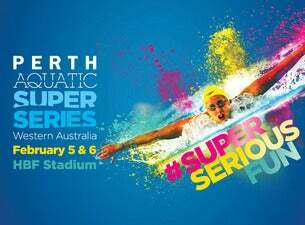 The Super Serious Fun is back at HBF Stadium on Friday 5 and Saturday 6 February 2016 as the Australian Dolphins Swim Team go head to head with China and Japan. See Australia's best swimmers LIVE in Perth for the last time before the 2016 Olympic Games in Rio! Catch all the action under the stars in the outdoor 10-lane pool at HBF Stadium with children's tickets starting from $16.24*. The Aquatic Super Series is a major international swimming event managed by Swimming Australia Ltd.